Speyer (German pronunciation: [ˈʃpaɪ̯ɐ], older spelling Speier, known as Spire in French and formerly as Spires in English) is a town in Rhineland-Palatinate, Germany, with approximately 50,000 inhabitants. Located beside the river Rhine, Speyer is 25 km (16 miles) south of Ludwigshafen and Mannheim. Founded by the Romans, it is one of Germany's oldest cities. Speyer is dominated by the Speyer Cathedral, a number of churches and the Altpörtel (old gate). In the cathedral, beneath the high altar, are the tombs of eight Holy Roman Emperors and German kings. The city is famous for the 1529 Protestation at Speyer. The first known names were Noviomagus and Civitas Nemetum, after the Teutonic tribe, Nemetes, settled in the area. The name Spira is first recorded in the 7th century, taken from villa Spira, a Frankish settlement situated outside of Civitas Nemetum. In 10 BC, the first Roman military camp is established (situated between the town hall and the episcopal palace). In AD 150, the town appears as Noviomagus on the world map of the Greek geographer Ptolemy. In 346, a bishop for the town is mentioned for the first time. 4th century, Civitas Nemetum appears on the Peutinger Map. 5th century, Civitas Nemetum is destroyed. 7th century, the town is re-established, and named Spira after a nearby Frankish settlement. In 1030, emperor Conrad II starts the construction of Speyer Cathedral, today one of the UNESCO World Heritage Sites. Also in the 11th century, the first city wall is built. In 1076, emperor Henry IV embarks from Speyer, his favourite town, for Canossa. In 1084, establishment of the first Jewish community in Speyer. In 1096, as Count Emicho's Crusader army rages across the Rhineland slaughtering Jewish communities, Speyer's Bishop John, with the local leader Yekutiel ben Moses, manages to secure the community's members inside the episcopal palace and later leads them to even stronger fortifications outside the town. It was ruled that anyone harming a Jew would have his hands chopped off. In 1294, the bishop loses most of his previous rights, and from now on Speyer is a Free Imperial Town of the Holy Roman Empire. In 1349, the Jewish community of Speyer is wiped out. Between 1527 and 1689, Speyer is the seat of the Imperial Chamber Court. In 1526, at the Diet of Speyer (1526) interim toleration of Lutheran teaching and worship is decreed. In 1529, at the Diet of Speyer (1529) the Lutheran states of the empire protest against the anti-Reformation resolutions (19 April 1529 Protestation at Speyer, hence the term Protestantism). In 1635, Marshal of France Urbain de Maillé-Brézé, together with Jacques Nompar de Caumont, duc de La Force, conquers Heidelberg and Speyer at the head of the Army of Germany. In 1689, the town is heavily damaged by French troops. Between 1792 and 1814, Speyer is under French jurisdiction after the Battle of Speyer. In 1816, Speyer becomes the seat of administration of the Palatinate and of the government of the Rhine District of Bavaria (later called the Bavarian Palatinate), and remains so until the end of World War II. Between 1883 and 1904, the Memorial Church is built in remembrance of the Protestation of 1529. In 1947, the State Academy of Administrative Science is founded (later renamed German University of Administrative Sciences Speyer). In 1990, Speyer celebrates its 2000th anniversary. Speyer lies on the Schifferstadt-Wörth railway and offers hourly connections to Mannheim and Karlsruhe. Since 1923 the mayor was a Lord Mayor. Simha of Speyer (13th century) German rabbi and tosafist. He was one of the leading signatories of the Takkanot Shum. ^ Chisholm, Hugh, ed. (1911). "Spires" . Encyclopædia Britannica. 25 (11th ed.). Cambridge University Press. p. 694. ^ "Städtepartnerschaften" (official web site) (in German). Stadt Speyer. Retrieved 2015-01-16. ^ "International collaboration". gmiezno.eu. Gniezno. Retrieved 3 May 2014. ^ "Ningde (China)" (official web site) (in German). Stadt Speyer. Retrieved 2015-01-16. The Diet of Speyer or the Diet of Spires (sometimes referred to as Speyer II) was a Diet of the Holy Roman Empire held in 1529 in the Imperial City of Speyer (located in present-day Germany). The Diet condemned the results of the Diet of Speyer of 1526 and prohibited future reformation. It resulted in the Protestation at Speyer. Sir Edgar Speyer, 1st Baronet (7 September 1862 – 16 February 1932) was an American-born financier and philanthropist. He became a British subject in 1892 and was chairman of Speyer Brothers, the British branch of the Speyer family's international finance house, and a partner in the German and American branches. He was chairman of the Underground Electric Railways Company of London (UERL, forerunner of the London Underground) from 1906 to 1915, a period during which the company opened three underground railway lines, electrified a fourth and took over two more. Speyer was a supporter of the musical arts and a friend of several leading composers, including Edward Elgar, Richard Strauss and Claude Debussy. He was chairman of the Classical Music Society for ten years, and he largely funded the Promenade Concerts between 1902 and 1914. His non-musical charitable activities included being honorary treasurer of the fund for Captain Scott's Antarctic expedition. For his philanthropy he was made a baronet in 1906 and a Privy Counsellor in 1909. After the start of the World War I, he became the subject of anti-German attacks in the Press. In 1915, Speyer offered to resign from the Privy Council and to relinquish his baronetcy, but the Prime Minister turned down the offer. He resigned as chairman of the UERL and went to the United States. In 1921, the British government investigated accusations that Speyer had traded with the enemy during the war, and had participated in other wartime conduct incompatible with his status as a British subject. Speyer denied the charges, but his naturalisation was revoked and he was struck off the list of members of the Privy Council. The German University of Administrative Sciences Speyer (Speyer University; German: Deutsche Universität für Verwaltungswissenschaften Speyer, DHV; formerly known as German School of Administrative Sciences), is a national graduate school for administrative sciences and public management located in Speyer, Rhineland-Palatinate, Germany. Founded in 1947 by the French occupational authorities as a grande école, today it is operated under the joint responsibility of both the Federal Republic (Bund) and all 16 German states (Länder). It runs four Master's programs, grants doctoral degrees and habilitations, offers a postgraduate certificate program, and administers programs of executive education. The school is a major training ground for German and international senior government officials. Noted alumni and faculty include former President of Germany Roman Herzog, former President of the Bundesbank Helmut Schlesinger, former Attorney General of Germany Alexander von Stahl, and CEO of BASF Jürgen Strube. U9 (S188) was a Type 205 submarine of the German Navy. She was laid down on 10 December 1964 by Howaldtswerke of Kiel. U9 was launched on 20 October 1966 and commissioned on 11 April 1967. She was decommissioned on 3 June 1993, and is now a museum ship at Technikmuseum Speyer in Speyer. The history of the Jews in Speyer reaches back over 1,000 years. In the Middle Ages, the city of Speyer (formerly Spira), Germany, was home to one of the most significant Jewish communities in the Holy Roman Empire. Its significance is attested to by the frequency of the Ashkenazi Jewish surname Shapiro/Shapira and its variants Szpira/Spiro/Speyer. After many ups and downs throughout history, the community was totally wiped out in 1940 during the Holocaust. With the fall of the Iron Curtain in 1989 Jews again settled in Speyer and a first assembly took place in 1996. The Imperial Diet (Latin: Dieta Imperii/Comitium Imperiale; German: Reichstag) was the deliberative body of the Holy Roman Empire. It was not a legislative body in the contemporary sense; its members envisioned it more like a central forum where it was more important to negotiate than to decide.Its members were the Imperial Estates, divided into three colleges. The diet as a permanent, regularized institution evolved from the Hoftage (court assemblies) of the Middle Ages. From 1663 until the end of the empire in 1806, it was in permanent session at Regensburg. The Imperial Estates had, according to feudal law, no authority above them besides the Holy Roman Emperor (or emperor-elect) himself. The holding of an Imperial Estate entitled one to a vote in the diet. Thus, an individual member might have multiple votes and votes in different colleges. In general, members did not attend the permanent diet at Regensburg, but sent representatives instead. The late imperial diet was in effect a permanent meeting of ambassadors between the Estates. Jochen Kühner (born 15 October 1980 in Speyer) is a German rower. At the 2008 and 2012 Summer Olympics, he competed in the men's lightweight four. He has also been world champion in this event, along with his brother Martin Kühner, Jost Schömann-Finck and Matthias Schömann-Finck. He has also been world champion in the men's lightweight eight, and runner up in the men's lightweight pair, again with his brother. Martin Kühner (born 15 October 1980 in Speyer) is a German competitive rower. He has won four medals at the World Rowing Championships with his twin brother Jochen. Mont-Tonnerre [mɔ̃.tɔ.nɛʁ] was a department of the First French Republic and later the First French Empire in present-day Germany. It was named after the highest point in the Palatinate, the Donnersberg. It was the southernmost of four departments formed in 1798 when the west bank of the Rhine was annexed by France. Prior to the French occupation, its territory was divided between the Archbishopric of Mainz, the Bishopric of Speyer, the Bishopric of Worms, Nassau-Weilburg, Hesse-Darmstadt, the Electorate of the Palatinate and the imperial cities of Worms and Speyer. Its territory is now part of the German states of Rhineland-Palatinate and Saarland. Its capital was Mainz (French: Mayence). Mainz, cantons: Alzey, Bingen, Bechtheim, Kirchheimbolanden, Mainz (2 cantons), Nieder-Olm, Ober-Ingelheim, Oppenheim, Wöllstein and Wörrstadt. Kaiserslautern (French: Kayserslautern), cantons: Göllheim, Kaiserslautern, Lauterecken, Obermoschel, Otterberg, Rockenhausen, Winnweiler and Wolfstein. 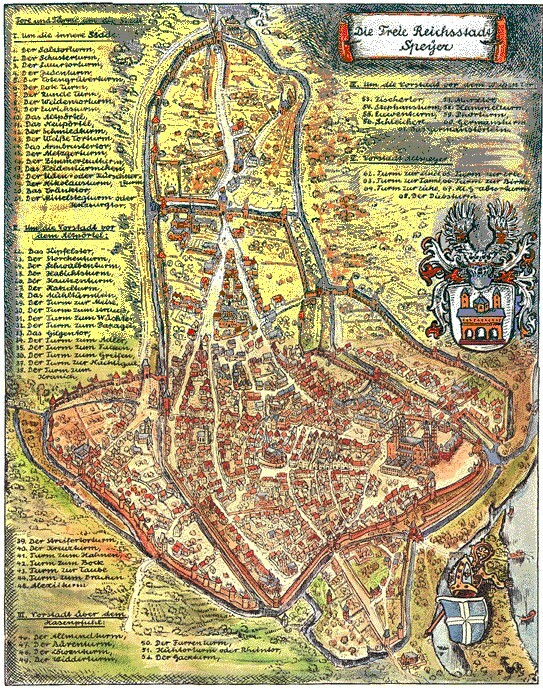 Speyer (French: Spire), cantons: Dürkheim, Edenkoben, Frankenthal, Germersheim, Grünstadt, Mutterstadt, Neustadt, Pfeddersheim, Speyer and Worms. Zweibrücken (French: Deux-Ponts), cantons: Annweiler, Homburg, Landstuhl, Medelsheim, Neuhornbach, Pirmasens, Waldfischbach and Zweibrücken.Its population in 1812 was 342,316.After Napoleon was defeated in 1814, the department was divided between the Kingdom of Bavaria (Palatinate) and the Grand Duchy of Hesse (around Mainz). The Nemetes (occasionally Nemeti) were a tribe settled along the Upper Rhine by Ariovistus in the 1st century BC. Their capital, Noviomagus Nemeton (or Civitas Nemetum), was close to the site of medieval Speyer.Their area of settlement was the contact zone between Celtic (Gaulish) and Germanic peoples. According to Tacitus, the Nemetes were "unquestionably Germanic". The name of the tribe, however, is Celtic as the name of its main town Noviomagus meaning noviios 'new' and magos 'plain', 'market' (cf. Old Irish mag 'plain'), as are those of a number of gods worshipped in their territory, including Nemetona, who is thought to have been their eponymous deity. Both of these names are taken to be derivations from the Celtic stem nemeto- "sacred grove".In De Bello Gallico, Caesar writes that the Hercynian Forest "begins at the frontiers of the Helvetii, Nemetes, and Rauraci, and extends in a right line along the river Danube to the territories of the Daci and the Anartes". Their territory on the left bank of the Rhine had belonged to the Mediomatrici during the time of Caesar and Strabo, but the Nemetes must have crossed the river and settled there sometime afterwards. Under the Roman administrative organization of Gaul, the Nemetes constituted a civitas of the province of Upper Germany with a relatively small territory extending from the Rhine into the Palatinate Forest and an administrative centre at Speyer. Ptolemy mentions Neomagus (i.e. Noviomagus) and Rufiniana as the towns of the Nemetes; if the latter is to be identified with Rouffach, Ptolemy is mistaken in attributing it to the Nemetes, for Rouffach is far to the south in Rauracan territory. It may also be supposed that Saletio (Seltz) belonged to the Nemetes, as in modern times it belonged to the diocese of Speyer; Saletio would have been near the northern limits of the Triboci, whose civitas later became the diocese of Strasbourg. The Nemetes fought alongside the Romans and Vangiones against the Chatti when the latter invaded in 50 AD.The name of the Nemetes has been suggested, on contestable grounds, as a possible source of the term for Germany and German people in Romanian: nemți/neamț, Hungarian: német(ek) and the Slavic languages (Russian: немцы nyemtsy, Polish: Niemcy, Czech: Němci). The Palatinate (German: die Pfalz, Pfälzer dialect: Palz), historically also Rhenish Palatinate (German: Rheinpfalz), is a region in southwestern Germany. It occupies roughly the southernmost quarter of the German federal state of Rhineland-Palatinate (Rheinland-Pfalz), covering an area of 5,451 square kilometres (2,105 sq mi) with about 1.4 million inhabitants. Its residents are known as Palatines. The Prince-Bishopric of Speyer, formerly known as Spires in English, (German: Hochstift Speyer, Fürstbistum Speyer, Bistum Speyer) was an ecclesiastical principality in what are today the German states of Rhineland-Palatinate and Baden-Württemberg. It was secularized in 1803. The prince-bishop resided in Speyer, a Free Imperial City, until the 14th century when he moved his residence to Uddenheim (Philippsburg), then in 1723 to Bruchsal, in large part due to the tense relationship between successive prince-bishops and the civic authorities of the Free City, officially Protestant since the Reformation. The prince-provostry of Wissemburg in Alsace was ruled by the prince-bishop of Speyer in a personal union. The Diocese of Speyer (lat. Dioecesis Spirensis) is a diocese of the Catholic Church in Germany. The diocese is located in the South of the Rhineland-Palatinate and comprises also the Saarpfalz district in the east of the Saarland. The bishop's see is in the Palatinate city of Speyer. The current bishop is Karl-Heinz Wiesemann. See also Bishop of Speyer for a list of previous bishops. As of 31 December 2006, 44.5% of the population of the diocese was Catholic. Sea Life Centres are a chain of commercial sealife-themed aquarium attractions. As of April 2017 there are 53 Sea Life attractions (including standalone Sea Life centres, mini Sea Life features within resort theme parks, and Legoland submarine rides) around the world. The chain is owned by the British company, Merlin Entertainments. Speyer Cathedral, officially the Imperial Cathedral Basilica of the Assumption and St Stephen, in Latin: Domus sanctae Mariae Spirae (German: Dom zu Unserer lieben Frau in Speyer) in Speyer, Germany, is the seat of the Roman Catholic Bishop of Speyer and is suffragan to the Roman Catholic Archdiocese of Bamberg. The cathedral, which is dedicated to St. Mary, patron saint of Speyer ("Patrona Spirensis") and St. Stephen is generally known as the Kaiserdom zu Speyer (Imperial Cathedral of Speyer). Pope Pius XI raised Speyer Cathedral to the rank of a minor basilica of the Roman Catholic Church in 1925.
one of the most important architectural monuments of its time and one of the finest Romanesque monuments.In 1981, the cathedral was added to the UNESCO World Heritage List of culturally important sites as "a major monument of Romanesque art in the German Empire". The Speyer family is a prominent Jewish family of German descent. It can be traced back to Michael Isaac Speyer (1644–1692), who had briefly been the head of the Jewish community in Frankfurt am Main in 1691–92. The family originates from Speyer in Palatinate, hence the surname. In the late eighteenth century, the Speyers were the wealthiest Jewish family in Frankfurt, well above the Rothschild family. The Technik Museum Speyer is a technology museum in Speyer (Rhineland-Palatinate), Germany. The Spiral, also known as 66 Hudson Boulevard, is a 65-floor skyscraper under construction in Hudson Yards, Manhattan, New York City. The project was announced in 2016 by real estate developer Tishman Speyer as a 1,005 foot skyscraper with 2.85 million square feet and 65 floors. The tower is being designed by Danish architectural firm Bjarke Ingels Group, which also designed the nearby West 57. The Spiral will be located on 34th Street between Hudson Boulevard and Tenth Avenue. When completed, The Spiral will join other developments made possible by rezoning, including Hudson Yards, 3 Hudson Boulevard and Manhattan West. A distinguishing feature of the proposed building is that each floor will have outdoor gardens that will spiral around the building. Tishman Speyer Properties is an American company that invests in real estate.